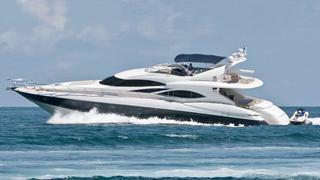 Tom George sends news of a $100,000 price reduction to the 25.6m motor yacht Carolina Dreamin. This Sunseeker 84 flybridge was built in 2000 and can accommodate 8 guests in 4 staterooms, including a full beam master suite with its own private access. She also has accommodation for two crew. She was recently fitted with a new Besenzoni hydraulic teak swim platform. She cruises at 24 knots and has a top speed of 27 knots. Tom goes on to say that she is undoubtedly the best kept Sunseeker 84 on the market, having been pampered by her owner for the past 9 years. She is also the only U.S. spec 84 with the popular private master access, hydraulic platform and crew quarters. Currently lying in Tampa, FL, her new asking price is $1,895,000, down from $1,995,000.